A special kind of therapy called Cognitive Behavior Therapy (CBT) is the treatment of choice for OCD. CBT involves the use of two evidence-based techniques: Exposure and Response Prevention therapy (ERP) and Cognitive Therapy (CT). Cognitive Behavior Therapy — sometimes accompanied by medication — is the only scientifically-supported and effective treatment for OCD. With Exposure and Response Prevention, a mental health professional trained in CBT conducts a series of controlled ERP sessions with the patient who has OCD. During these sessions, the therapist gradually exposes the person to the situations that trigger his or her obsessions and compulsions. Over time, the person learns to respond differently to these triggers, leading to a decrease in the frequency of compulsions and the intensity of obsessions. OCD symptoms often become so mild that they’re easily ignored; sometimes they disappear. In cases where creating the actual situation that triggers a compulsion is impossible, therapists can use imagined exposures, visualizations and recordings that can effectively increase anxiety levels for ERP exercises. When therapeutic exposures are repeated over time, the associated anxiety decreases until it is barely noticeable or actually fades entirely. The person then takes on more challenging exposures until they, too, become manageable. Effective ERP leads to “habituation,” which means people learn that nothing bad happens when they stop performing rituals. If you have an obsessive fear of germs, for example, a therapist conducting ERP therapy may work with you to encourage you to touch the top of a desk – which you believe is contaminated – and then wait longer and longer periods of time to wash your hands. Over time, this gradual exposure and the delayed response would help you learn to respond differently to the fear or thoughts about germs, which, in turn, would actually lead to a decrease in the frequency and intensity of the obsession. Cognitive Therapy, the second technique involved in CBT, helps an individual identify and modify patterns of thought that cause anxiety, distress or negative behavior. In other words, CT helps patients understand that the brain is sending “error” messages. Through Cognitive Therapy, the person learns to recognize these errors and confront the obsessions by responding to them in new ways. For example, a new mother standing by a window may have the thought, “Would I be capable of throwing my baby out the window?” Most people would easily dismiss this thought with something like “That’s a strange thought; where did that come from?” But some people hold fast to certain beliefs, such as the belief that thoughts are always important, or that having a thought is morally equivalent to actually doing it. Therefore, a mother with OCD may react to the thought of harming her baby by thinking “I’m a horrible mother for having such a thought! What’s wrong with me to think like that?”). Research shows that attempting to control your thoughts – or believing you should be able to control them – actually leads to more horrific images and frightening or repugnant thoughts. Using Cognitive Therapy, this mother might be asked to challenge her thoughts and would be taught a more suitable alternative to her current way of thinking: “I’ve held a number of babies before, and I have never hurt any of them.” Strategies such as self-talk, learning to separate oneself from the disorder, and analyzing the realistic chances or probability of a catastrophe’s occurrence are part of Cognitive Therapy. Most CBT treatment is conducted on an outpatient basis once a week with “homework” consisting of daily exposures to be completed between therapy sessions. In severe cases, people may require more frequent sessions or even residential treatment. This treatment may seem unusual; you may even think it wouldn’t work. Or perhaps you’ve already tried to resist compulsions, without much success. But with the right therapist and sufficient time and support, Cognitive Behavior Therapy has helped thousands of people control their OCD. In fact, some studies show that more than 85 percent of the people who complete a course of CBT experience a significant reduction in OCD symptoms. CBT is the only form of behavior therapy strongly supported by research for the treatment of OCD. Therefore, it’s extremely important to find a cognitive behavior therapist who has training and experience in treating OCD – usually a psychologist with a Ph.D., Psy.D., M.A. or M.S. degree, or a specially-trained social worker. 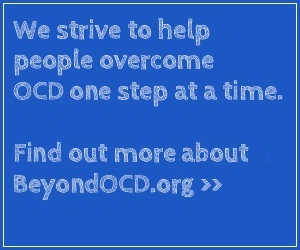 Beyond OCD can help you find a treatment provider. Imagining life with more free time and without crippling anxiety helps many people with OCD stay motivated to stick with ERP until the end of treatment. Following therapy, people can look forward to returning to work or finding a better job, restarting an active social life, or taking up new hobbies to fill the hours that used to be consumed by obsessions and compulsions. With Metacognitive Therapy (MCT), people are taught to ignore their intrusive thoughts by learning to emotionally detach from the obsession and to observe the obsession without judgment. MCT focuses upon changing a person’s perception of the significance of experiencing intrusive thoughts and the perceived need to react to those intrusive thoughts.